I wanted to give you a quick review on one of the yummiest products on the market. 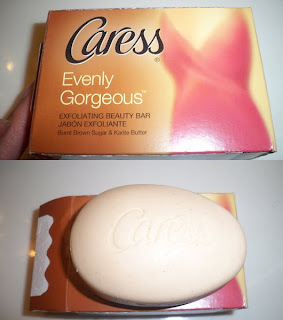 Caress has just released a new line called "Evenly Gorgeous" - featuring an exfoliating beauty bar and body wash. I myself, am a "Bar of Soap" girl when it comes to keeping it clean in the shower. I paired this new product with a washcloth and got to testing. First off, the scent is amazing. It smells like you're in a pastry shop when you're using this in the shower. The sugar and caramel scent mixed with the steam of the shower is heaven. This bar is also different in that it features exfoliating beads embedded directly into the soap. You know I love those multi-use products! In all, the scent and moisturizing qualities alone would definitely make me buy this again. For the body wash, I gave this to my bestie to review. She's definitely a body wash type of gal. For Christmas I always get her sugar/dessert scented body washes from more pricey brands like Philosophy. I wanted to see how this popular drug store brand would hold up. Cons: I can't really think of any cons..probably b/c I've been buying the brand for a while lol. As you can see, even compared with pricier brands like Philosophy, this body wash holds up. It smells absolutely great and is even better on the wallet. My bestie is a loyal user of Caress products as I can see why. Now I can save some cash getting her those pricey body washes! Check these out in the body wash/soap aisle of your local supermarket. 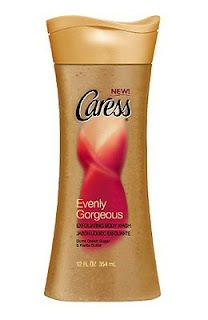 oh gosh I remember a time in college when i was obsessed with caress shower gel, lol it was all I'd get (the red one). I don't think I've seen an exfoliating bar soap before, that sounds interesting, too bad we don't have Caress here in Canada. I've been using the bodywash for 3 weeks now and I love it! I'll have to check out the bar. i LOVE the body wash...i will definitely be checking out the bar soap though. i didn't notice any extra exfoliation either but i have pretty soft skin anyway because i moisturize like a psycho! i have been using the body wash for a month & i love it. def leaves skin moisterized and def exfoliates. i think i am going to try the soap bar to go along!